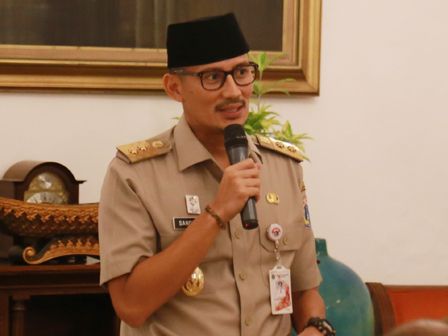 Jakarta Vice Governor, Sandiaga Uno encourages Himpunan Pengusaha Muda Indonesia Jakarta Raya (Hipmi Jaya) to collaborate with Jakarta Provincial Government to reduce unemployment.
" We want to grow a better economy in Jakarta"
"Current unemployment rate in Jakarta is still seven percent. We want to grow a better economy in Jakarta to make Jakartans more prosperous," he stated while attending on Hipmi Jaya Buka Bersama (breaking the fast together) event at City Hall, Tuesday (6/5). According to him, Hipmi Jaya can contributes through One Kecamatan One Center for Entrepreneurship (OK OCE) program. "Through entrepreneurship spirit, we will create job opportunities, especially in creative economy section. Also, UMKM and beginner entrepreneurs will be taught about technology and digital," he said. For information, there are also talk show and donation for orphans in this ev ent.